Is hitting the open road on your beloved motorcycle one of your favorite pastimes? Do you enjoy meeting "locals" and learning from them about the area? Are you someone who likes to lend a helping hand? Do you like motorcycle camping because itís inexpensive, but occasionally wish for a soft bed and a hot shower? If you answered yes to any of these questions then Motorcycle Travel Network is for you. We are travelers of the open road. We left home on July 11, 2004 to seek out and experience our country in a more personal way. While traveling, we have camped, stayed with family and friends and in youth hostels. However some of our most rewarding and enriching experiences have come while staying with ‘hosts’ - gracious people who have given us bed and breakfast for a night or two and often shared meals with us. These are people and places we will never forget, but none of them were motorcycle enthusiasts. We thought “wouldn’t it be great if we could stay with others that have the same love of riding and travel that we have”. 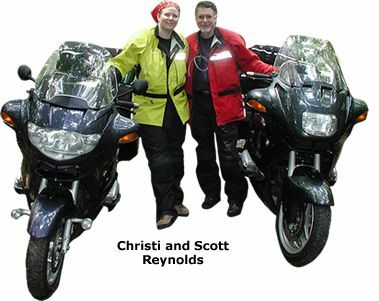 From this idea, Motorcycle Travel Network was born! Our hope is that motorcyclists of all makes and models, that love to tour on their bikes, are friendly and enjoy meeting people, will open their homes to other like-minded motorcycle travelers.